O&O DiskRecovery 4 functionality begins where other programs leave off. 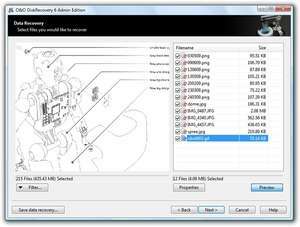 This software combs every sector of a hard disk, memory card, or digital camera to find lost files. Even when files systems are formatted or destroyed, it is possible to reconstruct once deleted data. Over 300 file types can be recognized and restored, including Word documents, Excel workbooks, Access Databases, etc. O&O DiskRecovery Personal Edition 8.0.335 is a shareware program and can be used as a demo to try the software until the free trial period has ended. A full version of the program is available after the trial period ends. For security reasons, you should also check out the O&O DiskRecovery Personal Edition download at LO4D.com which includes virus and malware tests. Additional screenshots of this application download may be available, too. O&O DiskRecovery Personal Edition has a presence on social networks. O&O DiskRecovery Personal Edition download been highly rated by our users.